Sundown Riverside, a tranquil setting to relax and unwind. 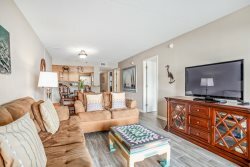 Walk-up to the 3rd (top) floor for unbelievable views or stroll the Gulf shores via the private boardwalk beach access. Amenities include swimming pool, tennis courts, grilling area, boat docks. Affordable one bedroom, one bath unit available.